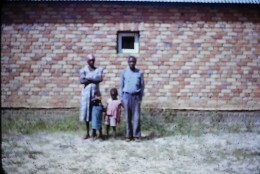 Alex took these Chit’ pictures after arriving from the U.K. as a young missionary educator to run Chit’s Upper Primary School. 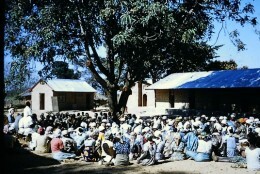 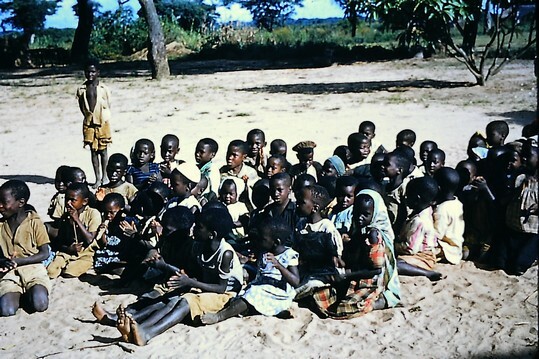 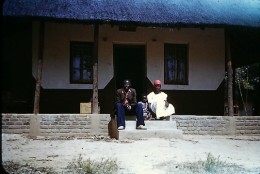 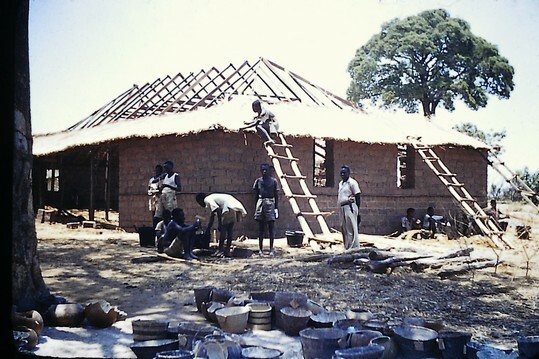 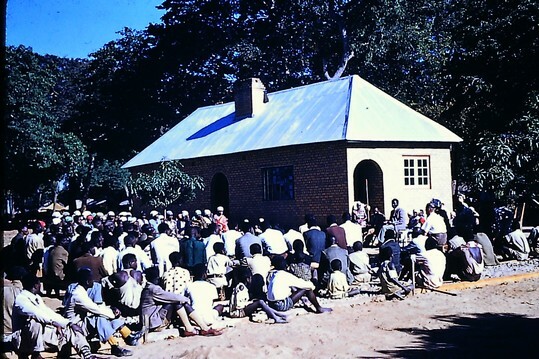 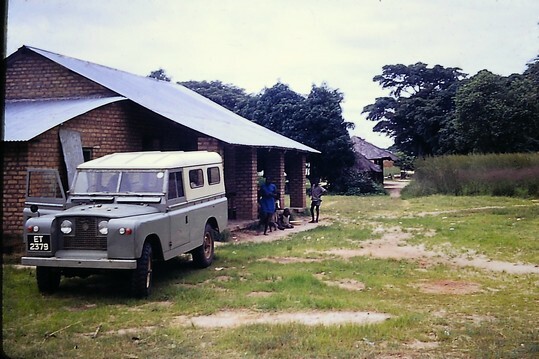 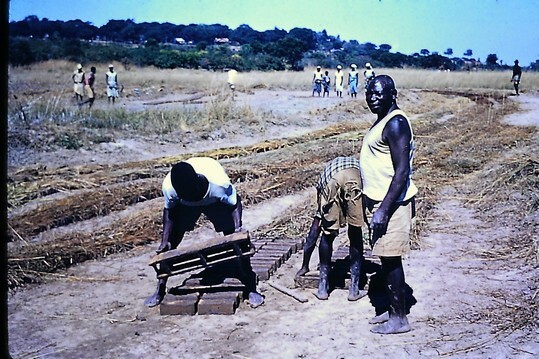 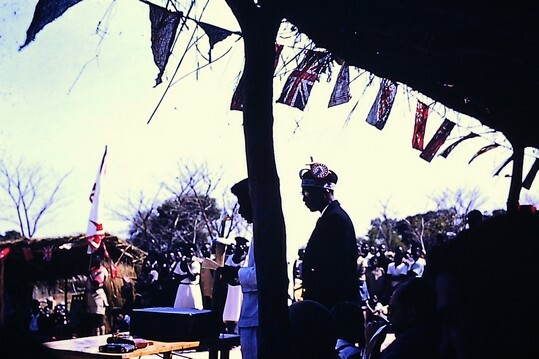 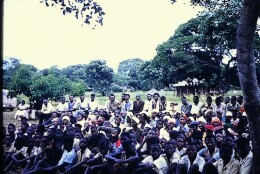 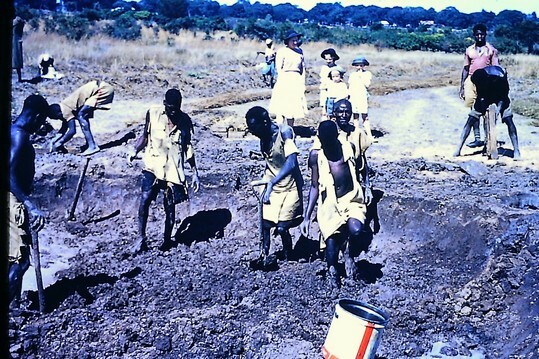 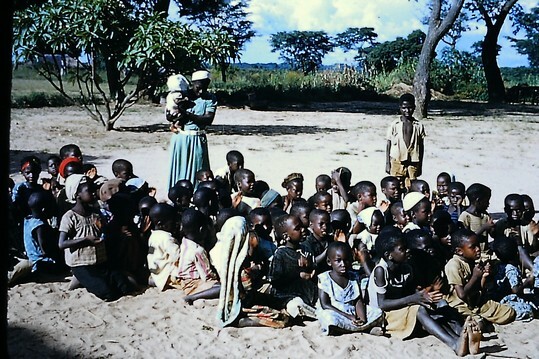 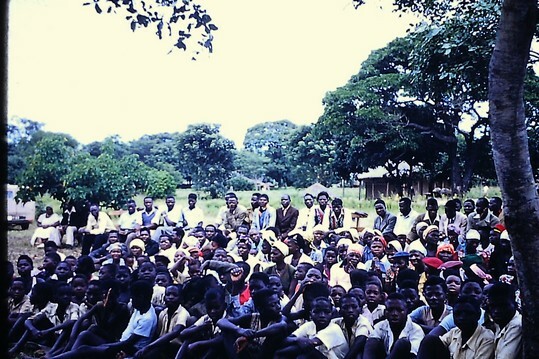 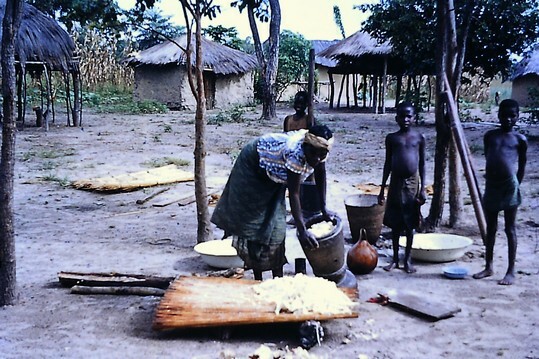 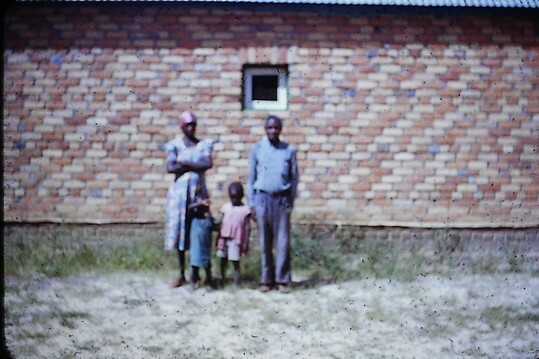 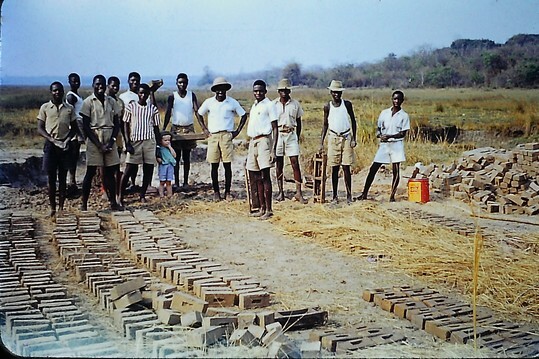 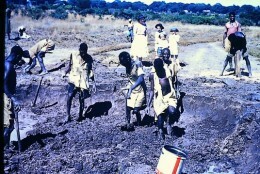 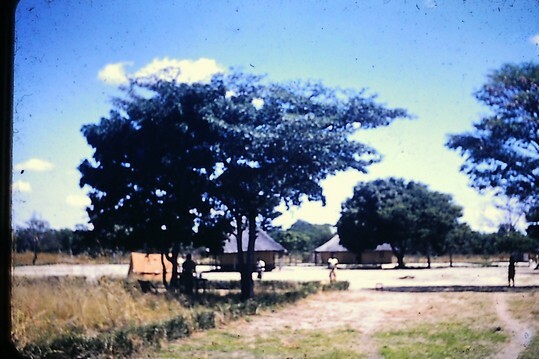 They included not only the school, but also the surrounding Zambezi (then Balovale) District. 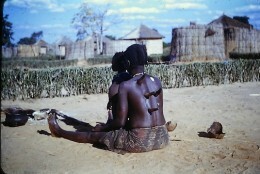 Note: these Chitokoloki (Chit’) pictures were divided into two parts because 212 pictures would not fit on a single page. 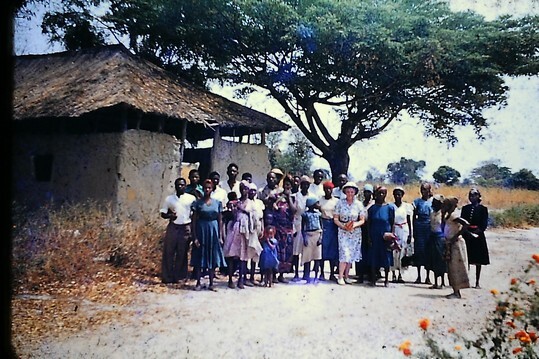 Neither Alistair Nisbet (Alex’s son) nor I have found any particular order for his photographs, nor discovered the year most were taken. 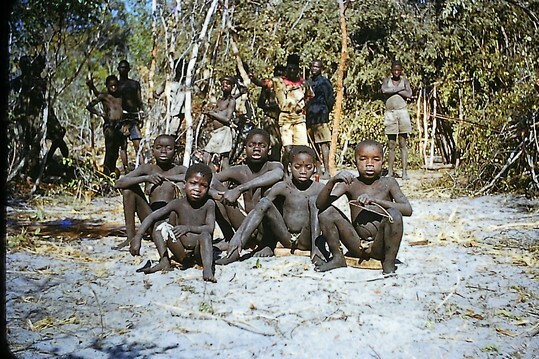 Thus, I have placed them in an order pleasing to me. You can now judge! 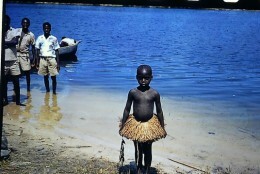 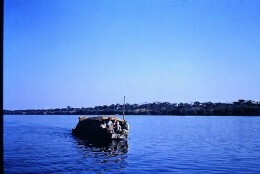 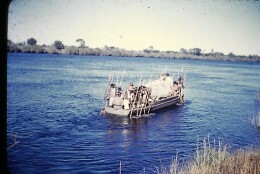 On and near the beautiful Zambezi River. 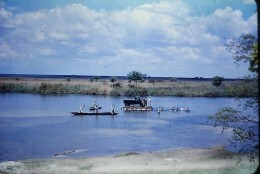 Engraved in my memory are the three years that I lived next to the Zambezi River 40 km. 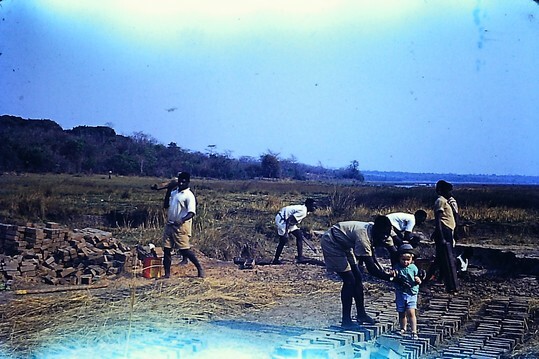 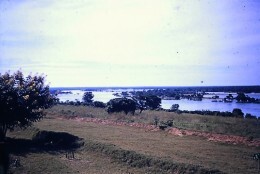 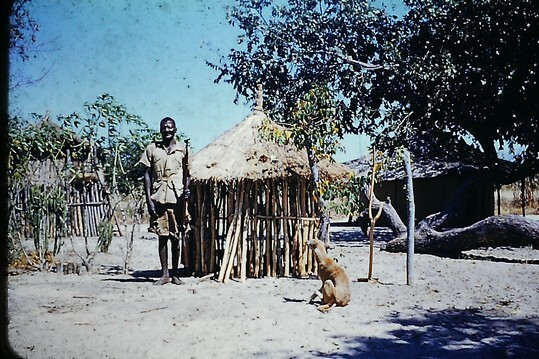 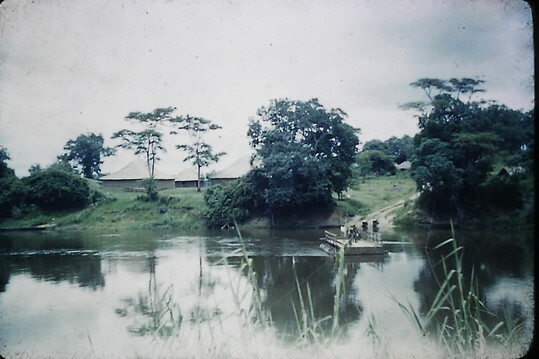 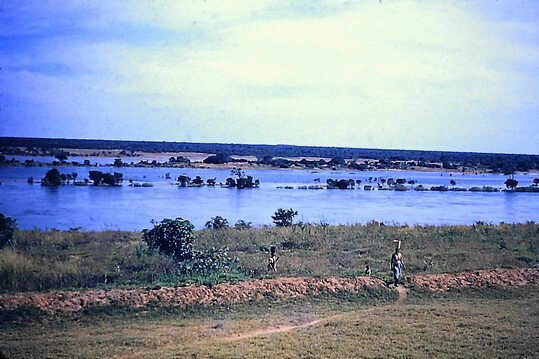 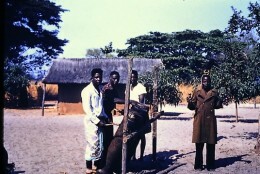 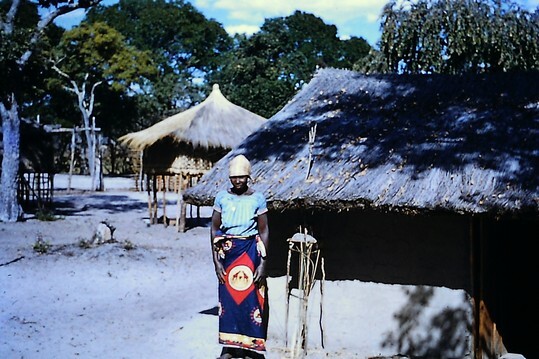 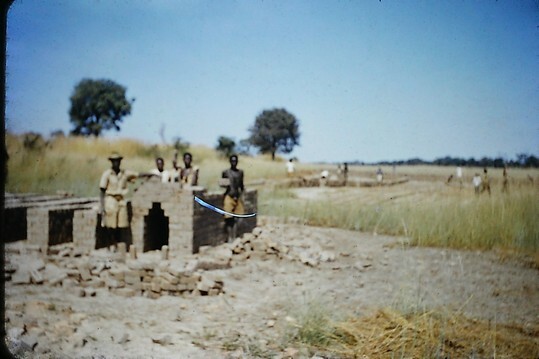 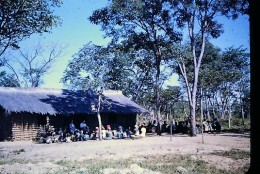 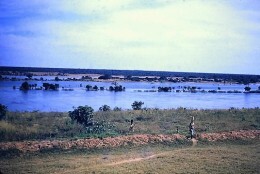 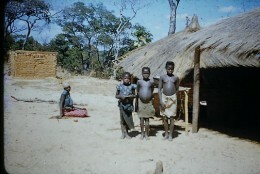 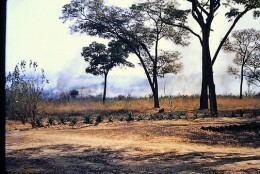 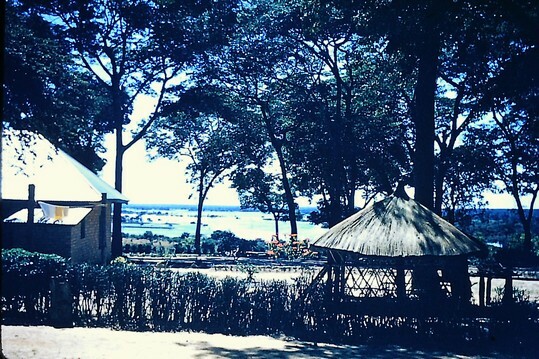 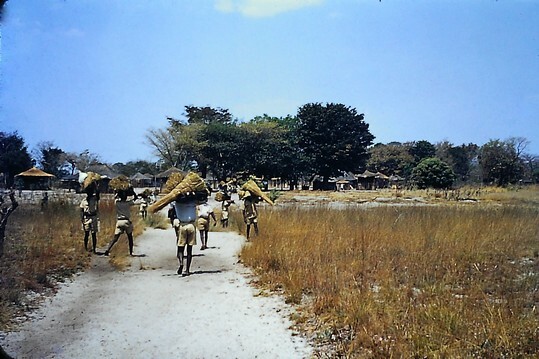 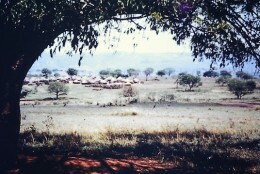 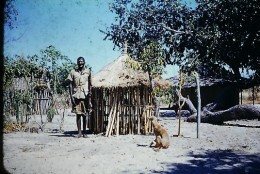 north of Chit’ in the town of Balovale (now Zambezi). 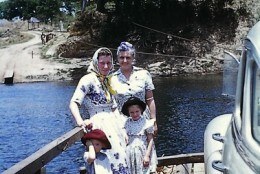 Many in the first two rows reflect the same beauty that I loved so much. The first two rows are contain four views from Chit’ and two from Chavuma (140 km. to the north). 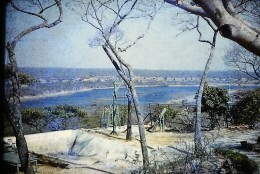 Dileas says that the top middle picture of the Zambezi was taken from Dr. Deubler’s garden. 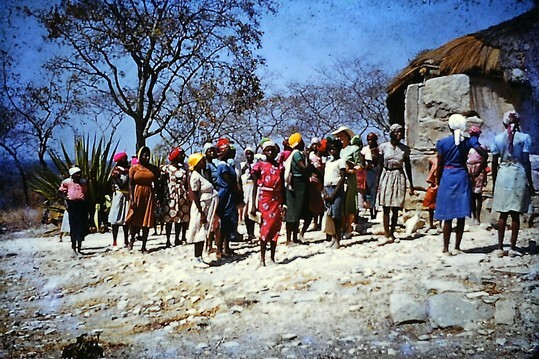 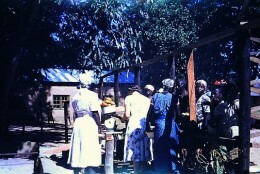 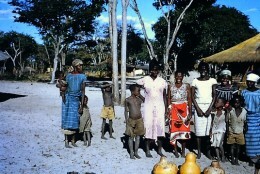 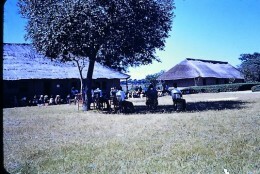 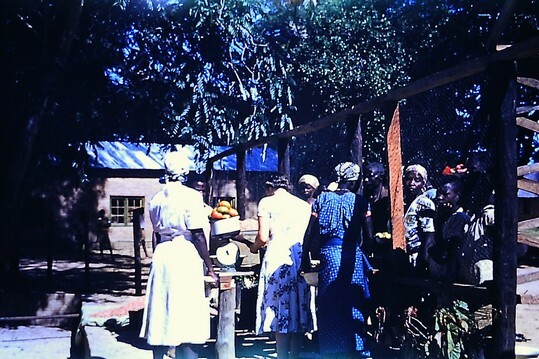 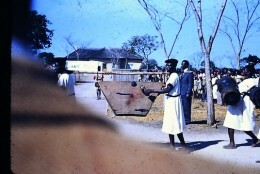 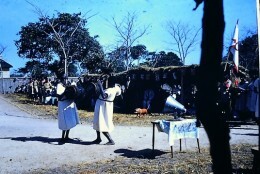 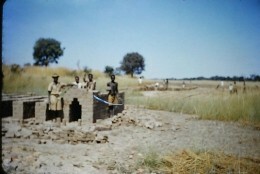 The picture in bottom right was taken at Chavuma mission in the Logan’s garden (note the dry pool in the foreground). 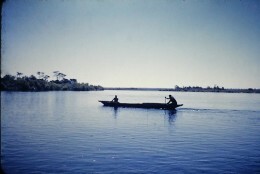 Out on the water in barges (flatboats) and canoes. 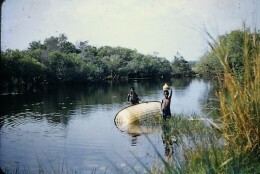 Use of the poles means the men are pushing upstream. 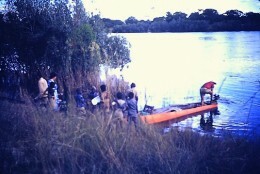 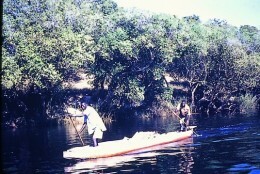 The dugout canoes remind me of the one I had at Balovale (Zambezi) Secondary School. 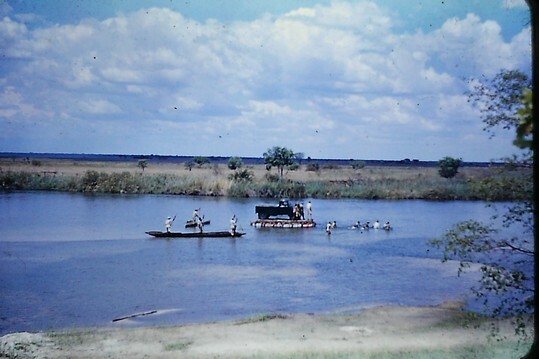 Both Dileas and I have found the pictures below of the pontoons very interesting and yet somewhat mysterious. 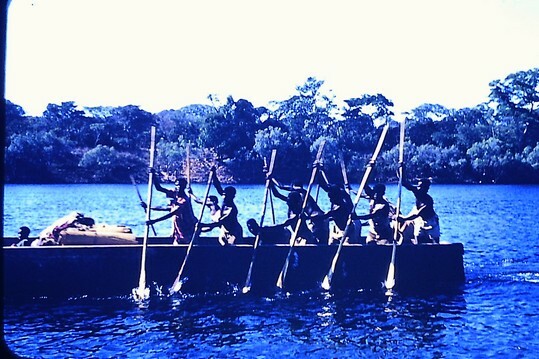 On the top row, from left, Alex is starting up and working on the engine, then in the middle people are using a large fishing net. The upper right probably is the Kabompo pontoon, but whether the side facing east or west, I can’t tell. 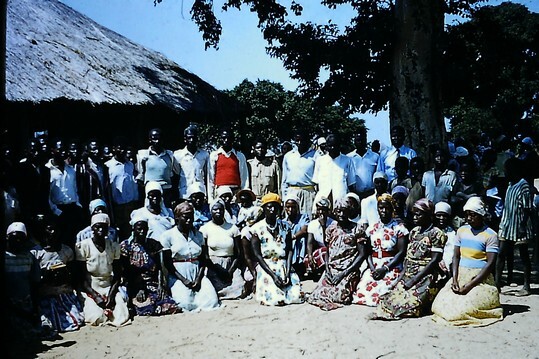 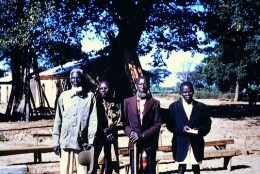 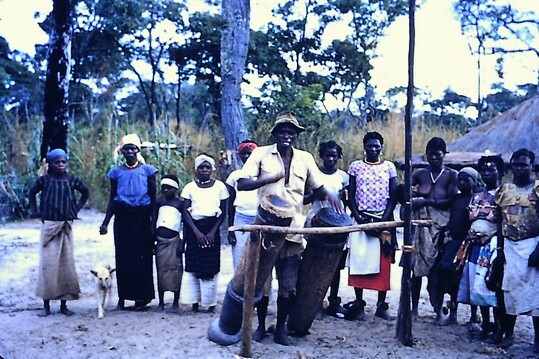 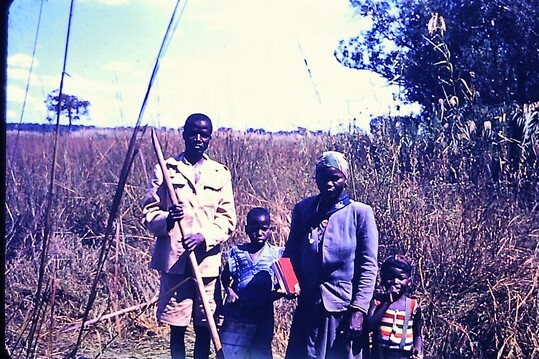 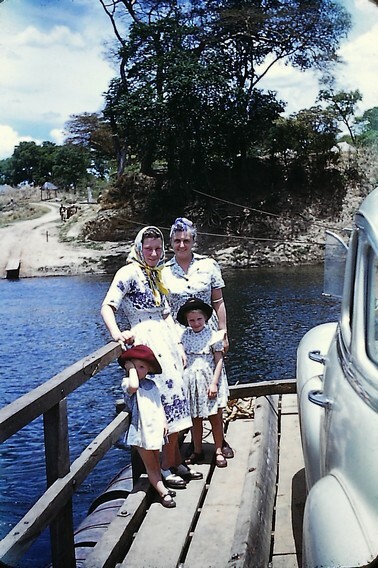 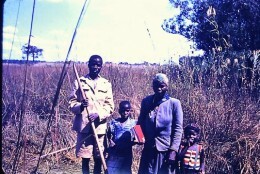 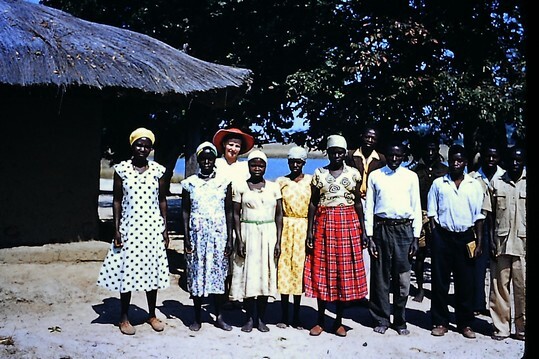 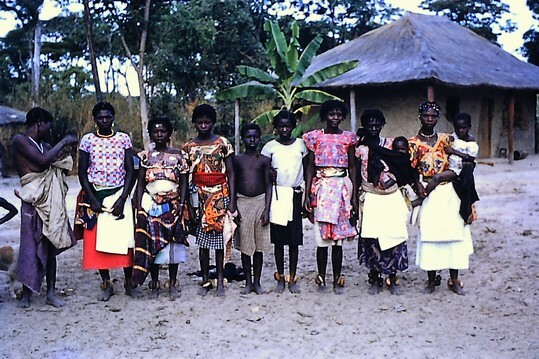 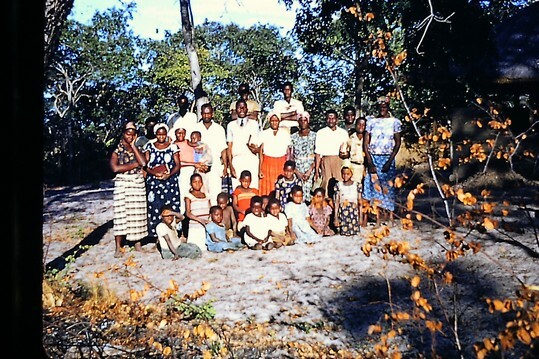 For the the lower left of the Kabompo pontoon, Dileas says “we were travelling to Chit’ for the first time, the Worsfolds were transporting us.” From front to back: Dileas, Marjorie, Janette and Hilda Worsfold. 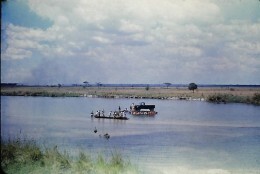 It is not clear where the lower two pictures of the truck on a small pontoon were taken. 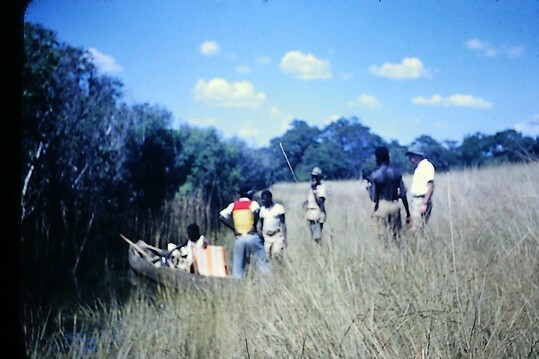 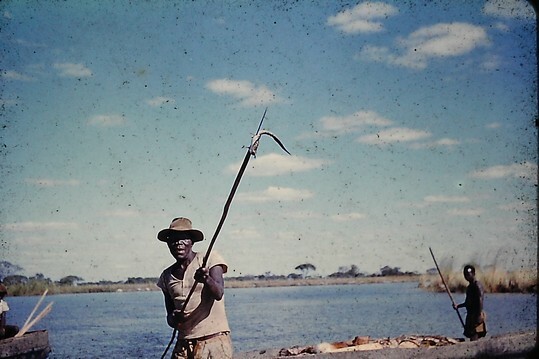 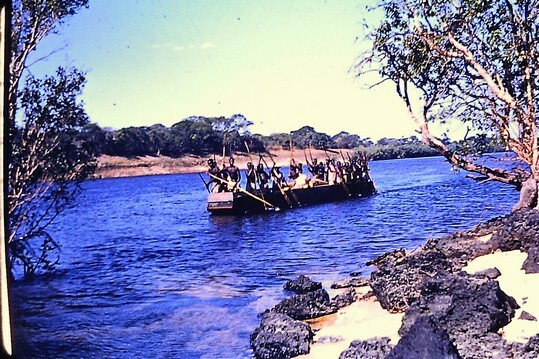 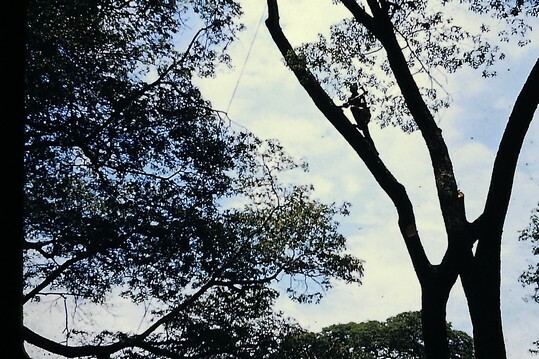 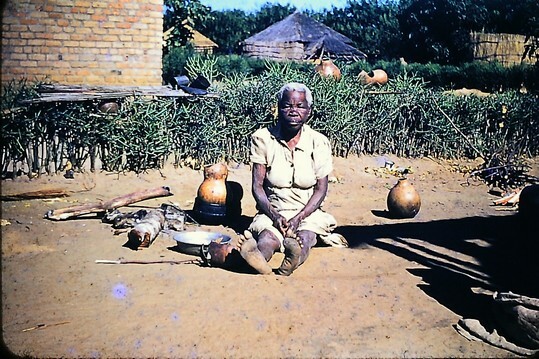 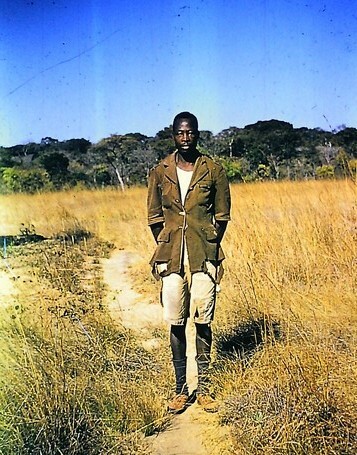 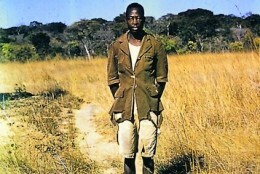 It was possibly on the Zambezi, just below Chavuma falls, but this is not certain. 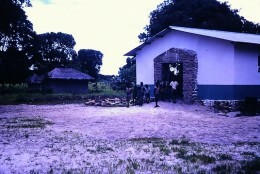 Buildings: Schools and school/churches. Many buildings had duel purposes. The location of most of these have not identified except for a few identified in the labels below the pictures. 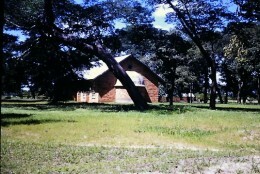 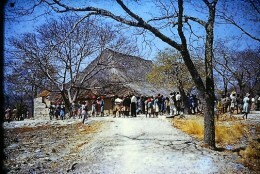 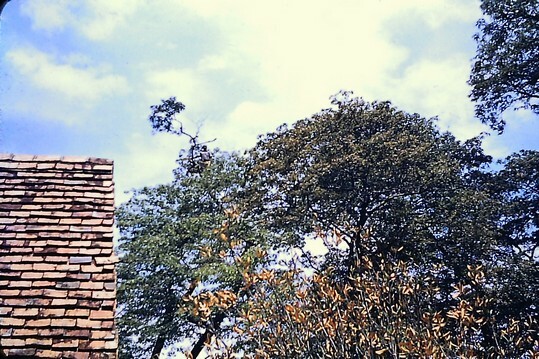 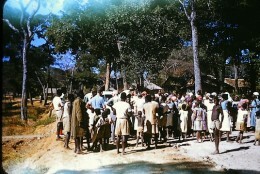 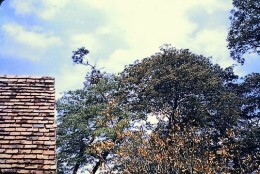 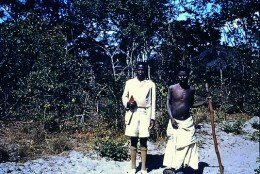 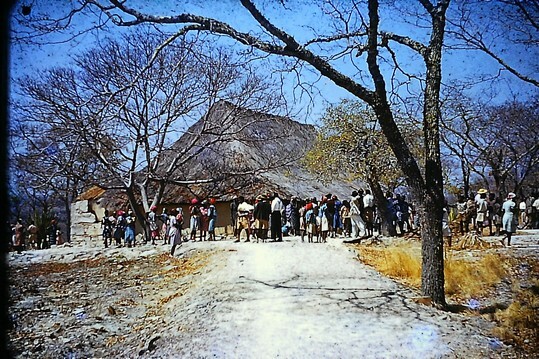 The picture on the bottom right of an old tree had a label, “Chitambo.” This is a famous place in central Zambia where David Livingstone reputedly died. 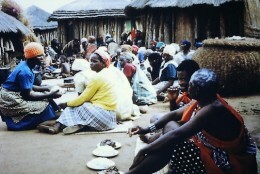 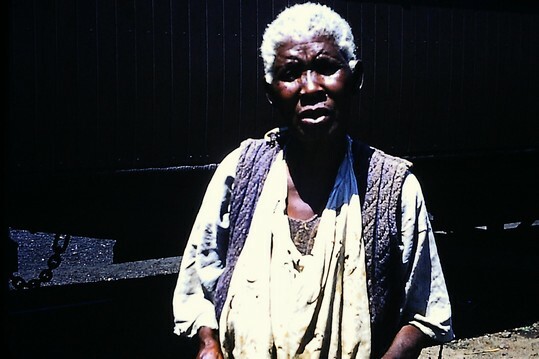 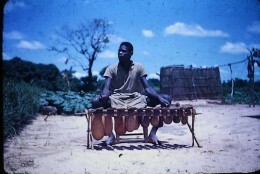 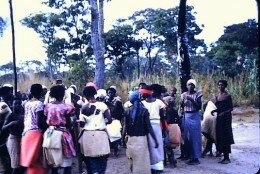 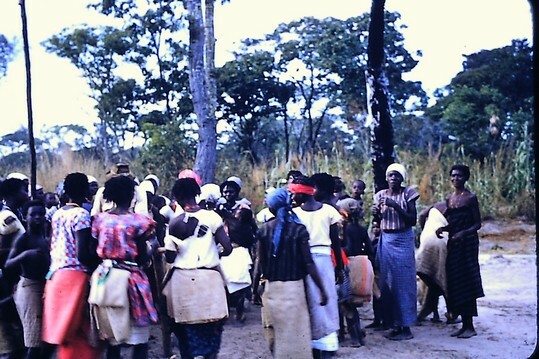 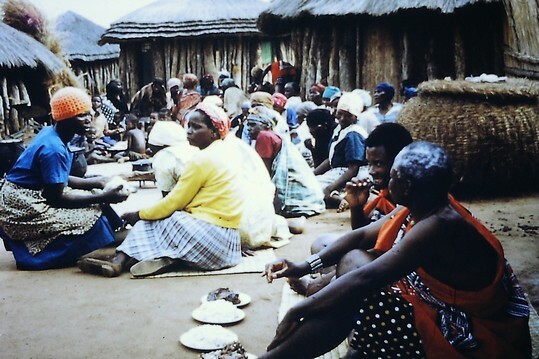 Traditional music and aspects of traditional life. 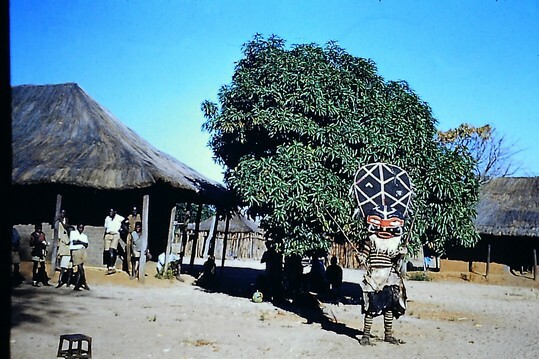 The first two rows are traditional musical instruments except for the bottom right which Alex labeled: “Kayongo Kdiwengu Capital” and Dileas says is a “shrine to spirits.” Can anyone clarify a bit more? 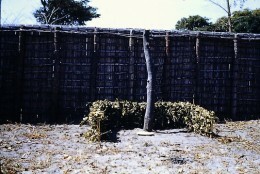 The following row shows three facets of traditional life and beliefs. 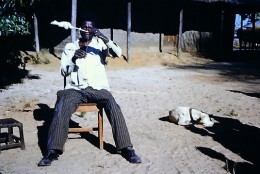 The top left shows “cupping” with heated horns as the woman seeks healing; the middle picture shows hunter next to a “spirit house”; and the right picture shows a makishi. I no longer remember how cupping worked, nor what a spirit house was for. 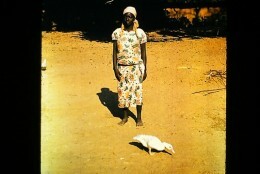 Someone will need to help. Makishi (plural likishi) was important in male puberty ceremonies and are described several places on this website where academic references are given and other pictures given. Children. 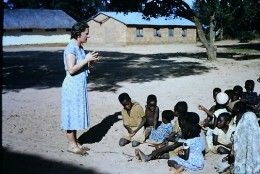 Marjorie with a group of Sunday school children in the top left and then more children’s photos. 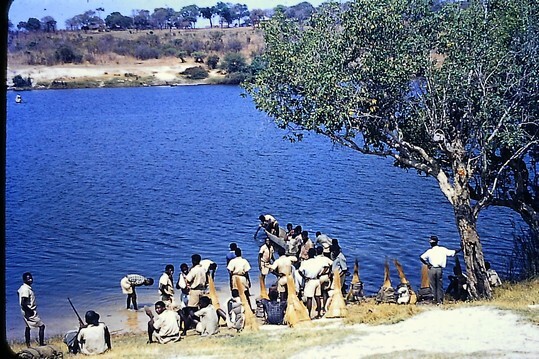 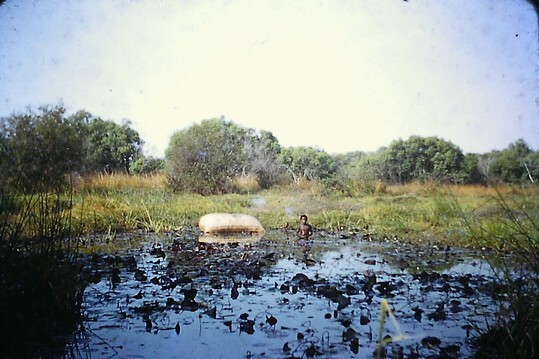 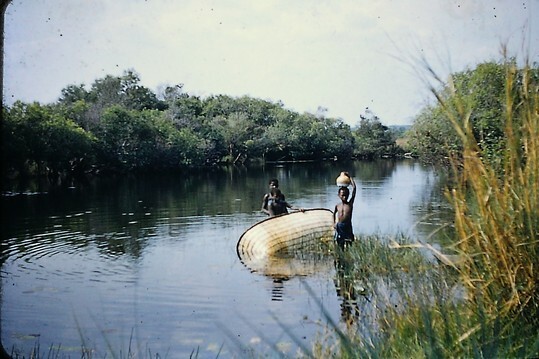 The bottom left may be part of a boys’ initiation camp and in the two in the bottom right near or in the water are (or have been) fishing. 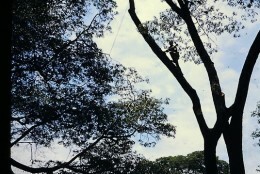 Individuals, named and unnamed, as indicated. 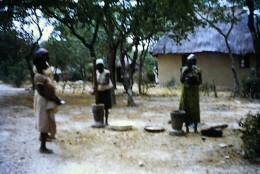 In the bottom right, a man is spinning cotton. Families and small groups of people, named and unnamed, as indicated. 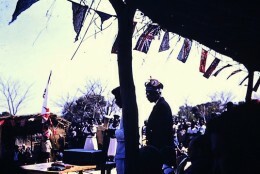 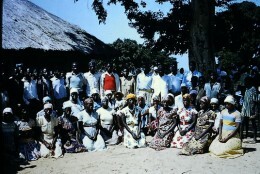 Bottom right is a royal family of one ethnic group speaking to a crowd of people. More assembly halls and congregants. 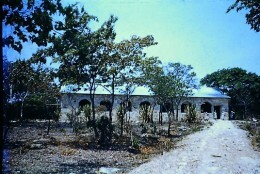 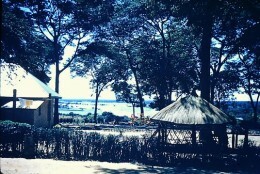 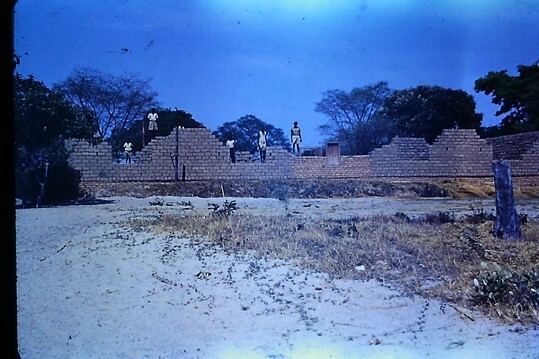 The top left is Chavuma hill meeting hall. 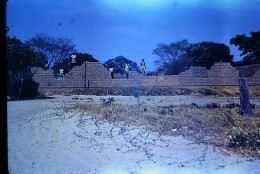 After placing the bottom center picture with these assembly halls, Dileas corrects me that the picture possibly was Chief Ishindi’s (Luvale) residence. 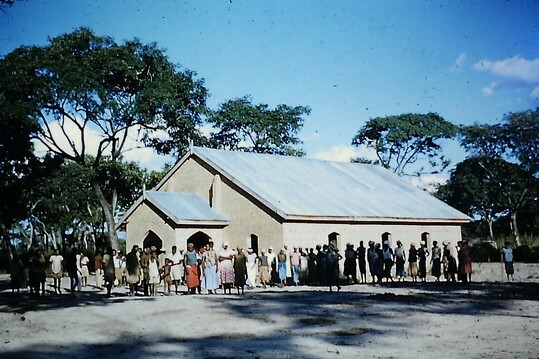 Also she later added that in the top right photo people are queuing for medical treatment; whether it was also was used for church services is not clear to me. Villages and aspects of village life. 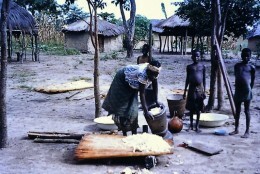 Note food preparation in the two left pictures in the middle row. 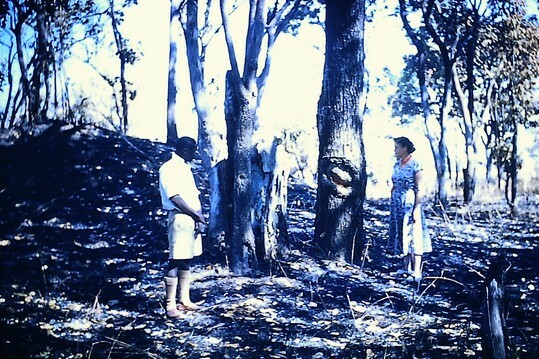 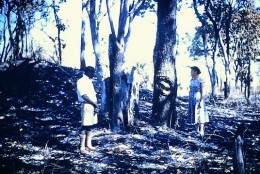 On the bottom left, Dileas says the woman is standing next to a grave with a pot on the top. 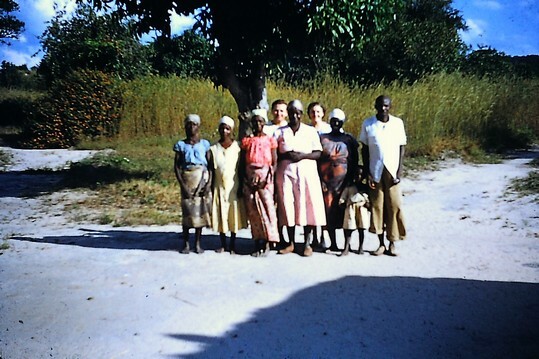 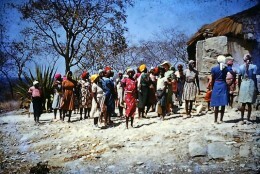 In the bottom right, Marjorie Nisbet is buying school food supplies from local women. 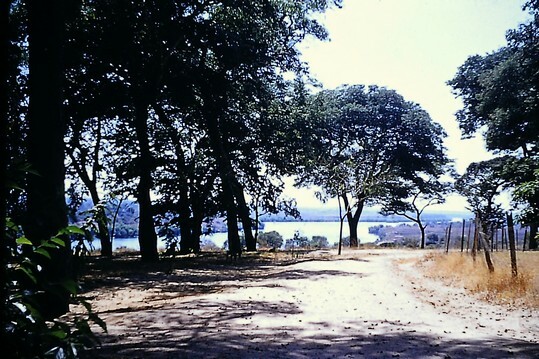 The great outdoors along the Zambezi River. 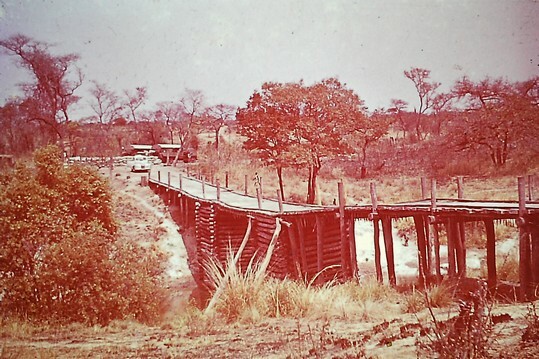 These assorted photos show a typical bush fire from the Nisbet’s home during the dry season (between Oct. and early Dec.); a new wooden bridge; honey gatherers (2 pictures); at the river’s edge w/Alex on the right, and in the bottom right, a baby crocodile at the end of a pole. 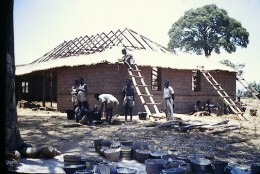 Building construction: all aspects. 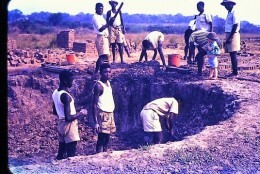 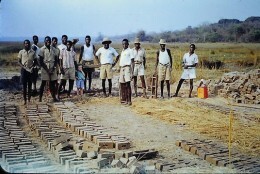 Digging foundations, making bricks, gathering roofing grass, laying the bricks to prepare the walls towards completion. 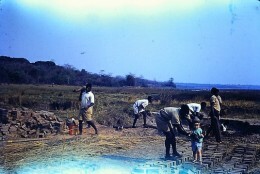 Alex’s notes say that the two pictures on the lower right show lepers at work completing their own building, (Many could do a lot within their own separate community.) Alastair Nisbet as a small child did his bit to “help” in the upper right photo.